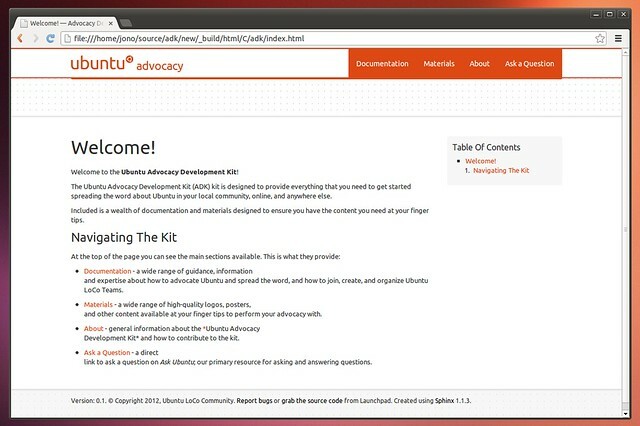 Earlier this week I blogged about the Ubuntu Advocacy Development Kit; designed to be a simple, straight-forward kit that includes all the documentation and materials that you need to to join and create LoCo Teams and help spread the word about Ubuntu in your area (whether in a LoCo Team or not). This is part of our goals to help grow the ubiquity of Ubuntu around the world. Access the kit easily on your desktop. The front page of the kit. The kit also includes PDF and ePub versions of the documentation so you can read how to advocate and spread the word about Ubuntu on your mobile, tablet, and e-book reader! In the future we plan on making formal releases of the ADK, but for now the daily PPA will automatically show you the most recent content in the kit as it is developed, conveniently accessible from the dash. Please be sure to report bugs. Please bear in mind though that the kit is only a few days old, so there is lots to do, and we would welcome anyone who can help! You can find information inside the kit of how to participate by clicking on About. Great work! Please include the ten tips from here: http://randall.executiv.es/tentips It would be great if there was a pdf which summarised everything in this kit, so that it can be printed and handed out at a Ubuntu Release Party or other gathering of Ubuntu-fans!